Catladyland: Cats are Funny: Pet FBI of Ohio is Doing Great Work! And We're Giving Away Some of Their Famous Catnip Pillows! Pet FBI of Ohio is Doing Great Work! And We're Giving Away Some of Their Famous Catnip Pillows! Image from the Pet FBI site. Cats are funny, but there's nothing funny about a lost cat. My friend Char of Sit4Pet/Char's Cat Sitting recently told me about this really cool organization called Pet FBI, an all-volunteer, nonprofit agency whose website is an information center for missing or found cats, dogs or other pets in the state of Ohio. Pet FBI was founded in 1998 by Maresa Fanelli, who envisioned a "gigantic electronic bulletin board where worried owners and good Samaritans could readily connect." It was one of the first sites of its kind and still houses more information than some national sites with a similar mission. Fanelli reports that about 1/3 of the pets listed on the site are reunited with their owners, but she suspects there are more connections that aren't being reported. Char uses the Pet FBI catnip pillows to break the ice with cat-sitting clients. In addition to their efforts in reuniting lost pets with their owners, they have a thriving spay/neuter/TNR OUTREACH team. Thanks to grant support from PetSmart Charities and the Kenneth A. Scott Charitable Trust, in 2012, Pet FBI made sure 728 free-roaming cats in Delaware county were altered. My Phoebe puts her seal of approval on the pillow! As you can see, Pet FBI is a little organization making a big difference in the lives of pets. 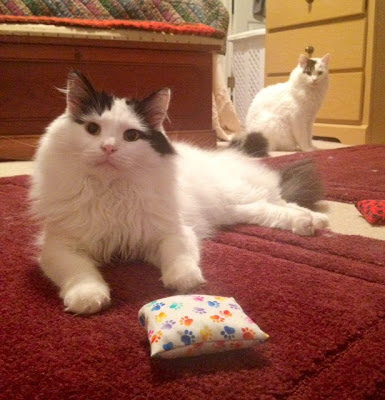 One of the ways they create funding is by selling products and one of their most popular items is the little homemade catnip pillows they sell in their eBay store. Char and Pet FBI made sure I got a couple for my cats to try and they went nuts! Cosmo was entranced by the magical nip. If you live in the Ohio or surrounding area, please click here to like their Facebook page and share the link. Otherwise, share the link so your Ohio friends may like it. You must comment WITH YOUR E-MAIL ADDRESS and indicate interest in qualifying for the giveaway and that you've either liked the page or shared it ... or both! If you don't Facebook, let us know that, too. The giveaway opens at 10:00 a.m. CDT today (5/25/13) and closes at 11:59pm CDT on Friday, 5/31/12. Good luck and thanks for helping spread the word!